Looking for some valuable reading material on web analytics, MarTech, AdTech and data privacy? We’ve got you covered. In this new blog post series the Piwik PRO team gathers all the news you can use in one place. A new survey from SAP Hybris finds that a majority of US consumers (71 percent) are willing to share their personal information, but at the same time they are concerned about privacy and data protection. Also interesting is the fact that there’s apparently a hierarchy of personal information consumers are ready to share. You can learn more about it from the MarTech Today article. Difficult times are coming for marketers with strategies based on programmatic or direct-sold advertising. Research shows that collecting personal data about users will become virtually impossible for them. Studies conducted by PageFair and various European organizations indicate that the percentage of users who would grant consent to requests such as “allowing third parties to track your online behavior for targeting of relevant ads” is very low, ranging from 5 to 20 percent. Read this article to learn about a potential solution for this problem. Will 2018 kill user segmentation and targeting (GDPR, Safari browser’s restrictions on cookies)? Will it? In our opinion, the year 2018 will surely bring many changes to the way marketers handle user data. And in order to comply with new laws and restrictions, the industry will have to make changes in the way it operates. But it’s not the end of digital marketing as we know it. Read our answer on Quora and see how we justify our point of view. Companies worldwide spend an enormous amount of money on digital advertising, and now they are facing a tremendous surge in adblock usage. PageFair shares its report on the state of affairs with blocked ads. Not only has there been 30% global growth in adblock software use, but also 74% of adblock users claim to leave websites with adblock walls. Dive into the report, find out what you’re up against, and devise a new ad strategy. Customer experience is ushering in a new era of personalization, and by 2020 it will surpass brand differentiators like price and product in importance. It entails serious challenges for martech companies and digital marketers that need to provide a personalized experience to customers hyperconnected across more devices and platforms than ever. To learn about the steps you can consider to deal with these challenges, read the article by Andy Betts. Every web analyst knows the importance of data. However, forming the right questions to get the bigger picture requires particular skills and the right approach. Fortunately, you can always find experts willing to share their insights and best practices so your marketing team won’t lag behind. Have a look at what a Google specialist has to say about it. 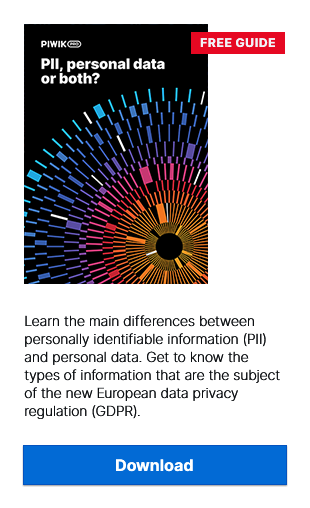 Free Cheat Sheet: PII, Personal Data or Both? Learn the main differences between personally identifiable information (PII) and personal data. Get to know the types of information that are the subject of the new European data privacy regulation (GDPR).